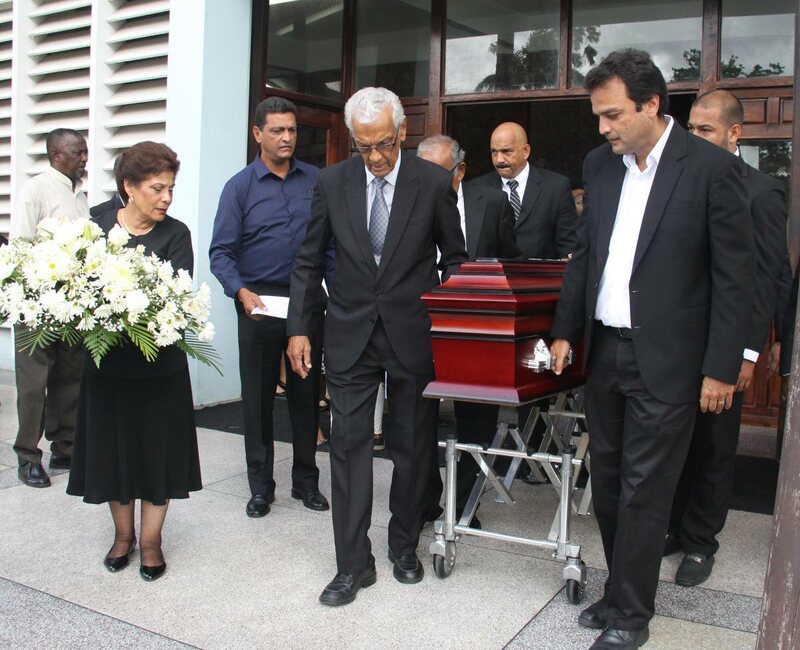 Family, friends and well-wishers said farewell to ‘Dame’ June Gonsalves at the thanksgiving and celebration of her life at The Church of the Assumption in Maraval yesterday. Gonsalves died on August 10, following a stroke she suffered three weeks ago. She was a media icon in the broadcast industry. Her son Gerard, who is an assistant principal in New York, said his mom shipped him off to the US when the price of oil went down 27 years ago, to make something of his life, expressed his sentiments at the funeral service. He said his mother taught him so much including how to show fear, to always have fun and face the day with cheer. He said she was always so able, so fast and so strong, always listened and never pried nor looked for praises, and was never one to boast. “You worked hard and those strong working hands led me through life and helped me understand that life can be hard and tough and a bother but through it all I had my mother. And because of you, I understood that life was actually pretty good. I believe in you and will follow your path, and when things go wrong I’ll look back and laugh,” said Gerard who described his mom as his superhero. After the service Gerard told the media when he was appointed assistant principal and having to deliver an address to his first graduation class it scared him. He sought his mom’s help. Gerard said one of his fondest memories of his mom was sitting and watching Sesame Street together every morning. But both his sister Teresa who cared for her mother and he will miss their mom. Delivering the sermon was Gonsalves’ friend Monsignor Christian Pereira who said she was a profound presence on the radio and blessed with many gifts. He recalled her descriptions of Carnival events, saying they were very clear and precise. As for when she took up a job at the Archbishop’s house during the time of Anthony Pantin, Pereira said Gonsalves she challenged Pantin, engaging his with her eloquence, but largely made him a better bishop in the process. “She sowed seeds of blessings for those who came after her,” said Pereira who also stated that Gonsalves found happiness in serving her country and its people. Gonsalves was interred at Lapeyrouse Cemetery.